He beat Judd Trump by 10-3 in the final, and got the highest break prize as well … with a trophy for it! This is his 30th ranking title, the second this season, but the first in China since he won … the Shanghai Masters in 2009. This win puts him at the top of the current one-year list. He has already secured his spot in the Players Championship 2018 and the Grand Prix 2018. O’Sullivan did the bulk of the damage in the first session by going 7-0 ahead, and he shared the next six frames to secure the trophy and £150,000 top prize. The Chigwell cueman moves ahead of John Higgins – who he beat in yesterday’s semi-finals – to second on his own on the all-time list of ranking event winners. It’s his second ranking title within a month having won the English Open in October, and he also reached the final of last week’s Champion of Champions where he lost to Shaun Murphy. O’Sullivan turns 42 next month but given the consistent excellence of his recent form, coupled with his dedication to health and fitness, it may not be long before he overtakes Stephen Hendry’s record of 36 ranking crowns. The opportunities to add to his tally come thick and fast as the Rocket now heads to Belfast to compete in the Dafabet Northern Ireland Open, followed by the Betway UK Championship and Scottish Open before Christmas (tickets for all of these events are still available – for details click here). 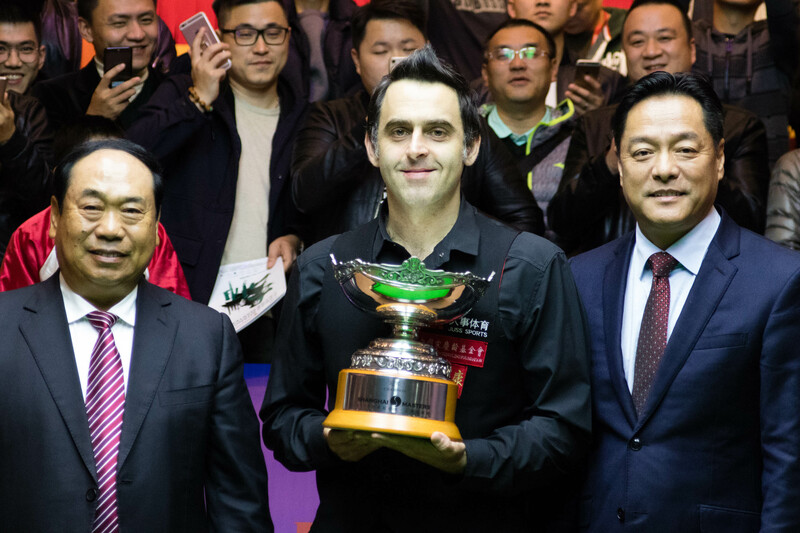 In winning his second Shanghai Masters title, O’Sullivan moves from seventh to fourth in the official world rankings and leaps to the top of the one year list. Bristol’s Trump has now lost in the final in Shanghai three times having finished runner-up to Higgins in 2012 and Kyren Wilson in 2015, and overall he has lost nine of his 17 career ranking finals. He still banks £75,000 and he’s up to second in the rankings, behind only Mark Selby. Breaks of 91, 76, 81, 56 and 70 helped O’Sullivan to win the first seven frames today. Trump finally got going with a run of 102 then cleared from blue to black in the last frame of the opening session to give himself hope of a fight back at 7-2. O’Sullivan started the evening session strongly with a 108 to go 8-2 up. Trump made a 64 in winning frame 11 and looked set to take the 12th until he broke down on 63, allowing his opponent to clear from the last red for 9-3. And when O’Sullivan cleared the colours to win frame 13 the contest was over. “I knew Judd was in good form because he has been playing well all week,” said O’Sullivan. “My mind has been as good as it has ever been this week. There were a few moments where it got a big edgy but I managed to think my way through. I wasn’t at my best today but mentally I was in the right place. “I have had a fantastic last four weeks. I feel a bit tired but I don’t mind that if it means winning tournaments. I’ve got my titles in the bank and I can build on that. “I’m not one for setting myself targets, but there’s nothing that can’t be done. If you said to me I would have another ten or 15 years playing snooker and be happy, but not get (Hendry’s) record, I would take that. I’d prefer that to playing for two or three more years and getting to 38 titles. It’s all about longevity for me. I enjoy the tour and the travelling and having a good life. It’s really great to see Ronnie so happy and wanting to play for years to come. So who is pessimistic all the time? Adam, I wasn’t being “pessimistic”, I was considering the fact that he would have to play in the morning in China (middle of the night in UK), likely to be tired and jet-lagged after rushing to Shanghai on the back of a defeat. You will admit, these weren’t ideal circumstances. BTW, the problem I have with your posts is not “pessimism”, it’s the agressive nature of them. “Sad looser”, “humiliating” etc… You don’t seem to be able to understand or accept that defeats are part of sport, just as much as victories and that no sportperson, as great as they might be, are at the top of their form, or indeed motivation, all the time. Am I pessimistic too who wanted a possible withdraw from Ronnie to get ready for the NI & UK & Scottish? Fantastic win for Ronnie, and a great way to bounce back from last week’s loss in Coventry. He seems to be taking a page out of Mark Selby’s game these days, by thinking his way around the table and winning the scrappy frames. Maybe it was not so much “taking a page out of Mark Selby’s game”, but drawing on or remembering certain skills. Watching Ronnie play I suddenly was reminded of Ray Reardon and how he has helped Ronnie to achieve/develop this kind of game, which was very obvious e.g.during WC 2004. Ronnie himself describes this in his book “Running”. Super stuff could have a big haul of cups this year, if he wants to ! Something what I never predicted. Final Sunday night come here played 6 matches from Wednesday-Saturday and despite the 7 hours difference he WINS THE SHANGHAI MASTERS 2017 IN STYLE!!! During the week he has lost only 9 frames!